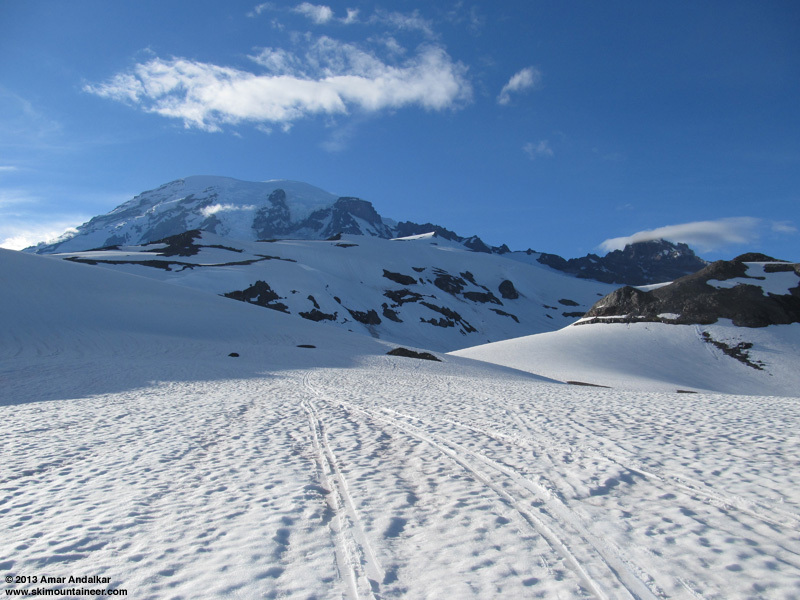 An awesome day skiing the stunningly scenic 11138 ft satellite peak of Mount Rainier, via the low route from Paradise through Cowlitz Rocks saddle down to the lower Cowlitz Glacier and up to the Whitman Glacier. The big advantage of this route is that it's still all snow the whole way right from the car at 4th Crossing, except a few yards of moraine at 6200 ft on the east side of Cowlitz Glacier, about 30 ft of 3rd class rock above the Whitman Glacier at 10800 ft, and the final snow-free scramble above 11000 ft. It's still skiable from 11000 ft, but most of the snow from 10800 down to 9600 ft is suncupped as much as thigh deep, really quite bad and only skiable because it was well softened in mid-afternoon. Mostly nice smooth corn below that from 9600 ft all the way down to the Cowlitz and back to the car. About 15 miles roundtrip with 7700 ft of gain for 7500 vert of skiing, but feeling like a bigger day which left us more worked than the numbers alone might suggest, far more than skiing similar vert on Mount Baker in a day like we had one week earlier. 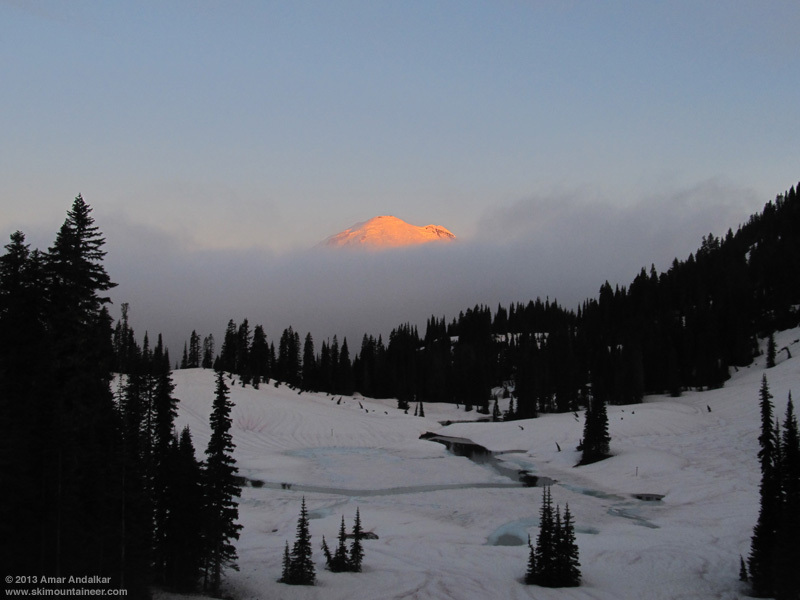 Sunrise on Little Tahoma and Big Tahoma above the cloud deck from Tipsoo Lake. Saturday was once again forecast to be the only nice sunny day between a pair of annoyingly wet multiday upper-level low pressure systems, and seeking the mind-blowing view from atop Little Tahoma seemed like the highest and best possible use of the day given the forecast 10500 ft freezing level and light winds, SW 5-10 mph at that elevation. Mike M, Luke, and I headed for Chinook Pass the evening before, hoping to car-camp above the clouds (in the free and legal USFS parking lot just east of the park gate), and indeed the clouds parted during the night to reveal a bright near-full moon and then a colorful dawn over eastern WA. The 35-mile drive to Paradise provided a sunrise view of the summits of Little Tahoma and Big Tahoma peeking out above the cloud deck from Tipsoo Lake, and brought us to Paradise just after the Climbing Information Center opened at 6am. We registered and drove down to 4th Crossing, it was nice that the Paradise Valley Road had finally opened to the public the day before (months after the park plowed it). The bridge at 4th Crossing. Despite the sign, this is definitely not the "Wrong Way" to Little T.
Starting from 4th Crossing is 200 ft lower than Paradise, but saves a half-mile of distance and provides a much more direct route towards the basin of the erstwhile lower Paradise Glacier, with less traversing and no up-down like the route from Paradise via Golden Gate. We skinned up just after 7am as the first rays of sunshine were reaching the road. The snowpack was about 3-5 ft deep at the road, and firmly frozen from there all the way up the west side of Mazama Ridge, but skinnable without ski crampons. We broke out into full sunshine atop the ridge and found nicely softened snow the rest of the way to Cowlitz Rocks saddle at 7100 ft. We switched to ski mode there and enjoyed a nice descent of 900 vert on smooth sun-softened corn down this ENE aspect just before 9am. 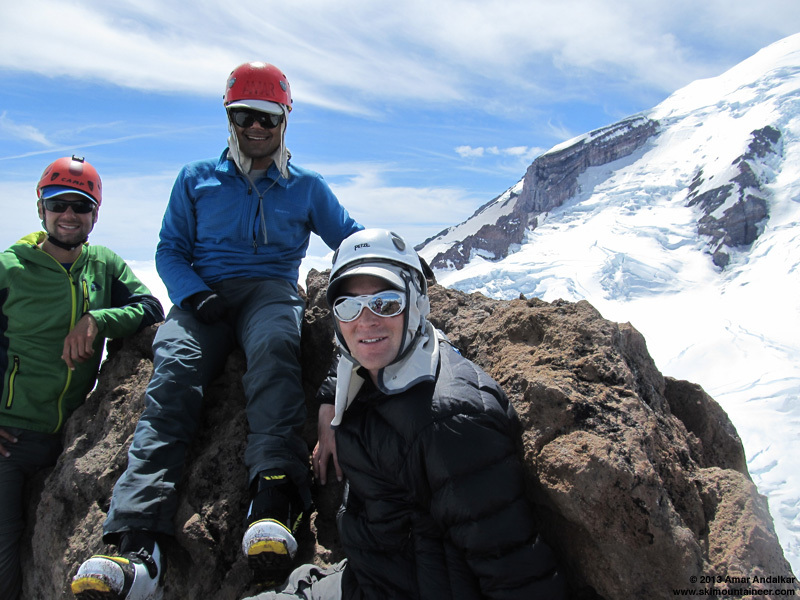 The slope drops into the magnificent amphitheater where the Cowlitz and Ingraham Glaciers each spill down 2000-foot icefalls on either side of the Cathedral Rocks and converge in one of the most scenic spots on the entire Mountain. A quick schuss brought us across the lower Cowlitz Glacier to the edge of its eastern moraine at 6200 ft. No crevasse issues at all here as usual, since it's a zone of compression located below the major icefalls and fairly flat (we did ski past one very thin crack). Unfortunately the moraine has already melted bare of snow for about 100 vertical ft (it's easily skinnable earlier in the season), but luckily a finger of snow extended up past its left edge and allowed us to avoid climbing the hideously loose dirt and boulders. Instead we booted up the snow finger and then traversed a short bit of heathery slope above the moraine to rejoin snow. We skinned from about 6300 ft up the obvious northeastward gully and angled left into the south-facing bowl, passing large piles of old avalanche debris, and gaining the toe of Whitman Glacier near 7800 ft just east of a large ice cliff. Then an easy cruise up the gentle slopes of the Whitman, staying right to avoid the few visible sags and crevasses far to the left. There's no real crevasse hazard here either, and we were glad we had decided to leave the glacier gear at home this time. 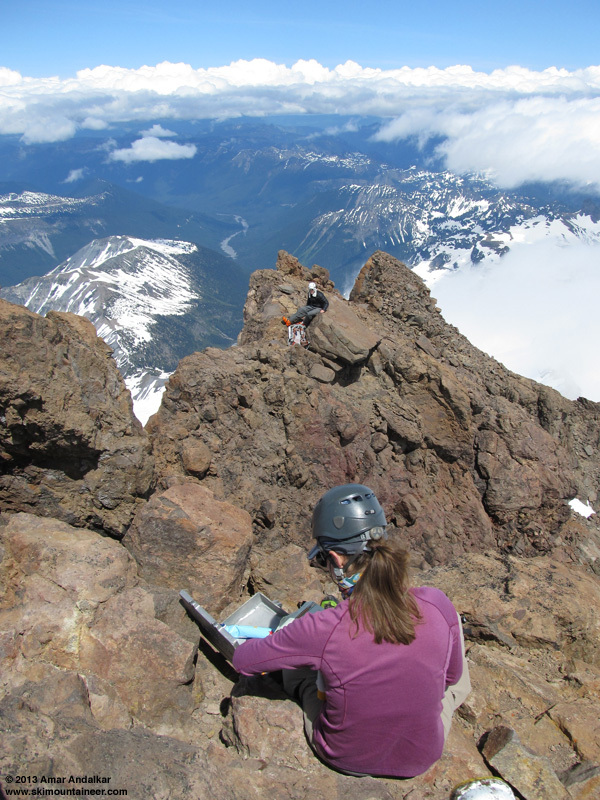 It's a spectacular area, a high plateau with excellent views of Little and Big Tahoma side-by-side, with numerous tiny specks visible far above and away, climbing on the upper Ingraham Glacier above the DC. We skinned up to 9600 ft, where the snow steepens past 35 degrees and became extremely bumpy and suncupped, apparently due to a combination of previous traffic, old slide debris, and windblown ash. Despite the evidence of previous crowds, we would be the only skiers on Little T this day, and in fact would meet only one other person all day car-to-car, a woman on foot who had come up the Fryingpan and left her partner at the 9100 ft gap connecting to the Whitman. We switched to booting with crampons and she joined us for the rest of the ascent. Mike took the lead and busted a renewed boot pack up through the confusing array of massive suncups interspersed with traces of fossilized old bootpack. 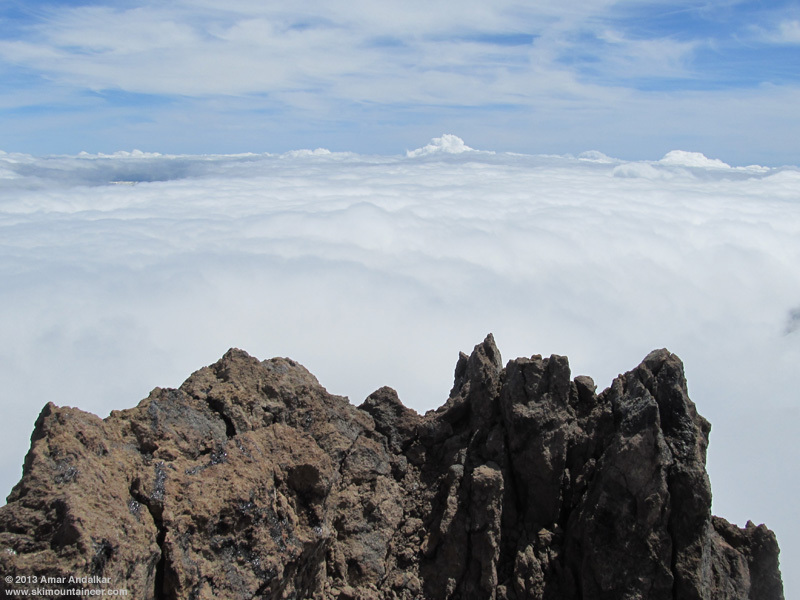 Throughout the late morning and early afternoon, a cloud deck had been building below us, thickening and rising slowly. 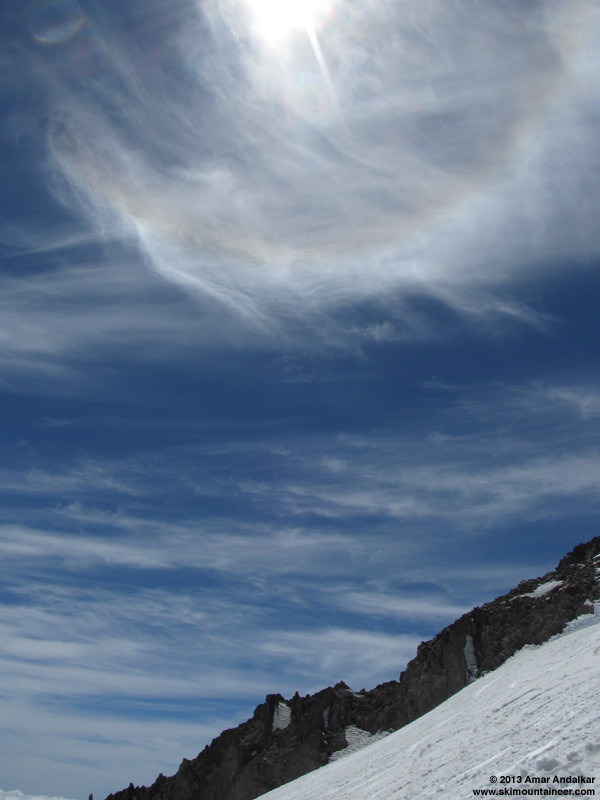 In addition, a few high cirrus clouds drifted past, producing a nice 22� halo for a short while after 1 pm, but nothing like the spectacular display of at least 4 different types of halos which were visible a week earlier on Mount Baker. I searched in vain for the circumhorizontal arc, hoping that the high solar angle would produce it once again (it was visible and photographed around that same time from Crater Lake, Oregon, 300 miles to the south). The 22� halo around 1:20pm. 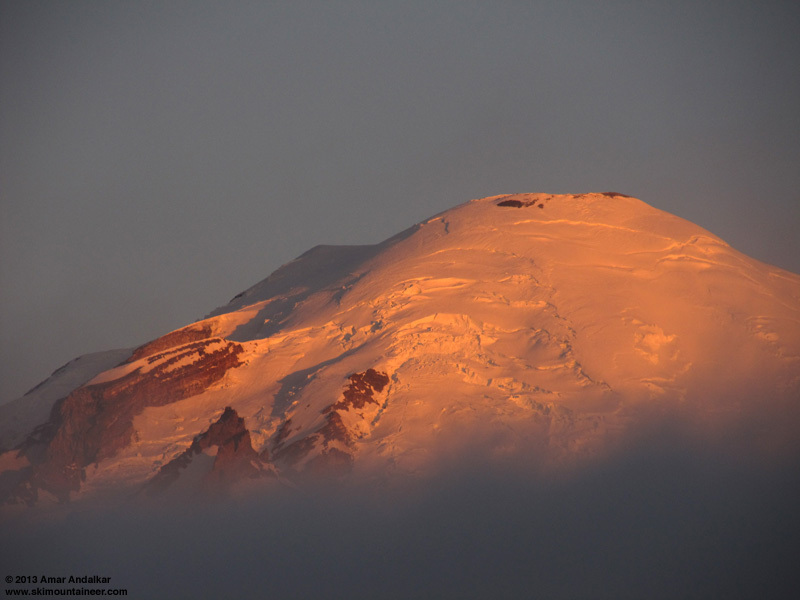 Solar elevation was about 66.5� at this time, shortly after solar noon which was at 1:09pm on Mount Rainier this day (see my Cascades solar calculator page). We reached the top of the Whitman Glacier at 10800 ft just before 2pm, climbed about 30 ft of bare rock (call it 3rd class, or perhaps low 5th class for about 10 ft in an objective rating system), and then continued onto the upper snowfield extending to about 11000 ft. We left our skis and packs at the top of this snow, the highest skiable snow at this time with only small snow patches remaining higher up. 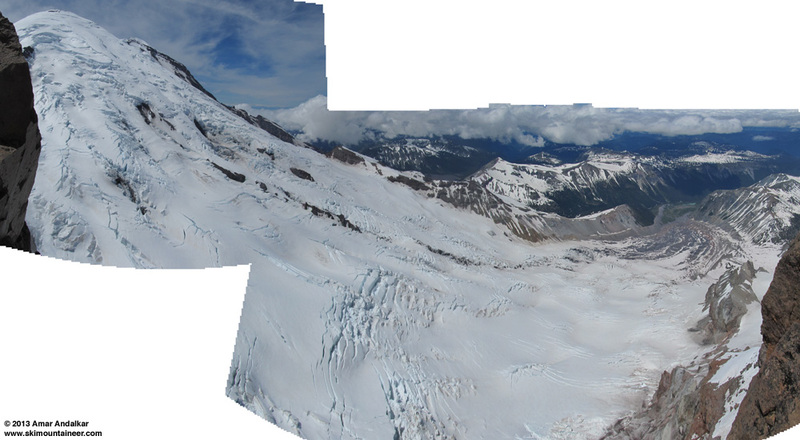 Three-shot panorama looking waaaaaay down, over 2000 ft straight down, of the entire Emmons Glacier from the summit ridge near 11120 ft. Should have shot this one much better, probably as a 3x2 grid of photos. An easy but cautious scramble along the summit ridge put us on top just after 2:30pm, luckily just in time to get the full view of Rainier along with the Ingraham and Emmons Glaciers as the clouds continued to rise from the south. The view is almost too good, too vertiginous and too awe-inspiring to fully appreciate or to capture in photos. Looking back east along the summit ridge from the true summit. 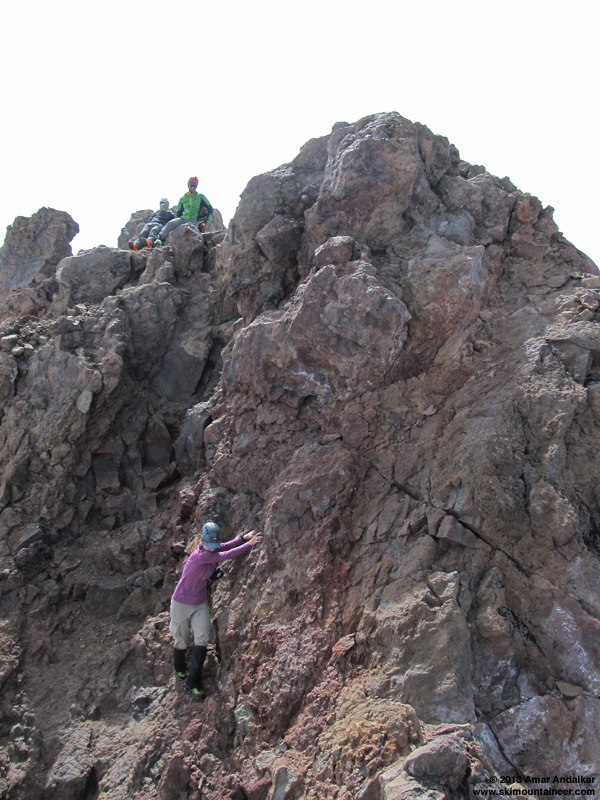 Fulgurites on the summit rocks, small areas of black glass formed by lightning strikes. The lightning melts the minerals in the rock, which resolidifies too rapidly for crystals to form, thus remaining in an amorphous, vitreous (glassy) state. The glass is very sharp, our new companion cut her finger instantly while touching it. The handholds on the final traverse after the notch definitely felt looser this time than on my previous ascents (the same spot mentioned by Chris in the discussion and photo in last week's Little Tahoma TR). It feels like an entire slab of rock, a few inches thick and several feet wide and high, is rapidly disintegrating at that spot. 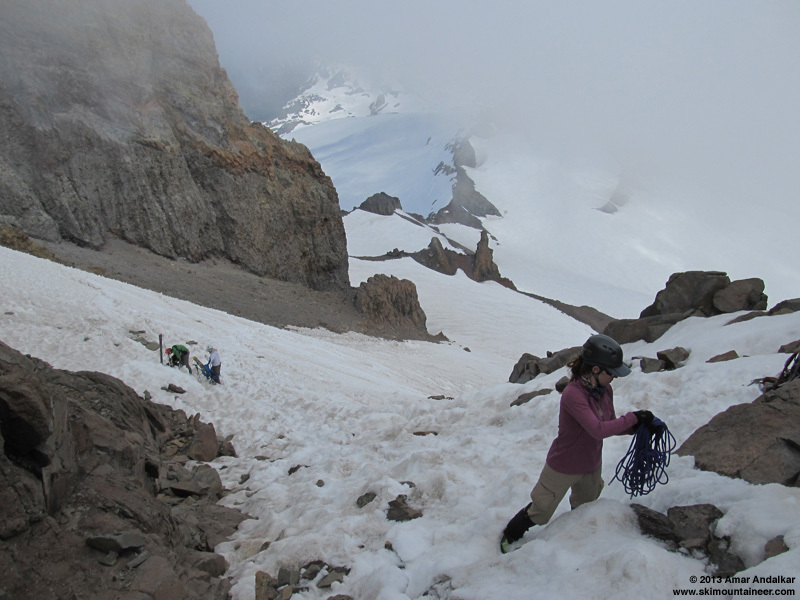 The traverse definitely requires a good deal of caution, especially in ski boots. Looking back towards the true summit and the section of loosest rock on the traverse, near her hands. The cloud deck which had been thickening and rising for several hours was now about to engulf the summit by 3pm, so it was time to head down and ski. I skied the highest snowfield from 11000 down to 10800 ft, which was actually fairly smooth and decent skiing, a few nice turns with the top 2-3" sluffing off with each turn. Looking back up from about 10800 ft at fresh ski tracks on the upper snowfield. We descended the rock step using a 30m rope that our new companion had carried as a handline / arm rappel, which made descending it with skis on packs and in ski boots somewhat easier (although I've downclimbed it with no rope the previous times I've been above that step). Looking down from just below the rock step at the uppermost Whitman Glacier. Luckily the visibility remained clear for skiing, despite clouds now fully covering the summit above us. 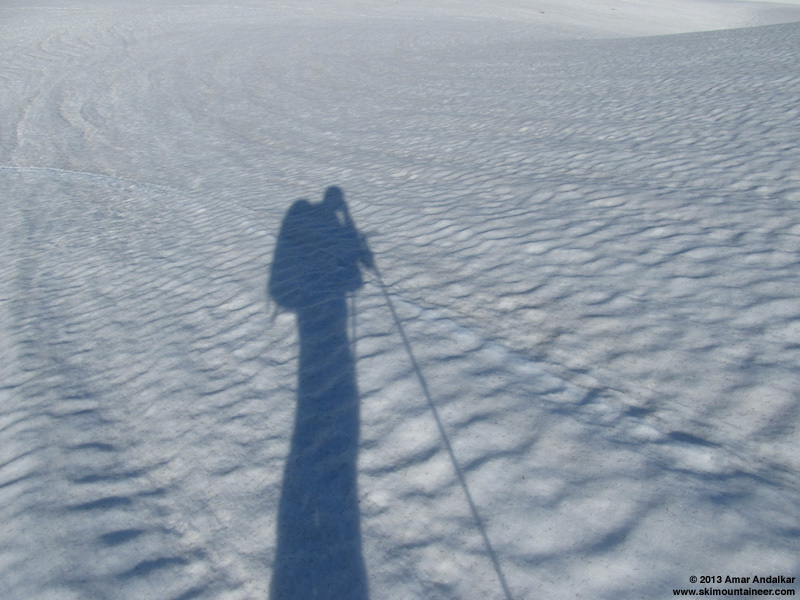 However, the skiing on the uppermost Whitman Glacier was truly bad, the suncups being almost as deep as the first time I skied it in July 2009 in more summertime conditions, although thankfully the snow was much softer this time. We traversed left and right, looking for and linking smoother patches of snow, but it was slow going at best down to about 9600 ft. 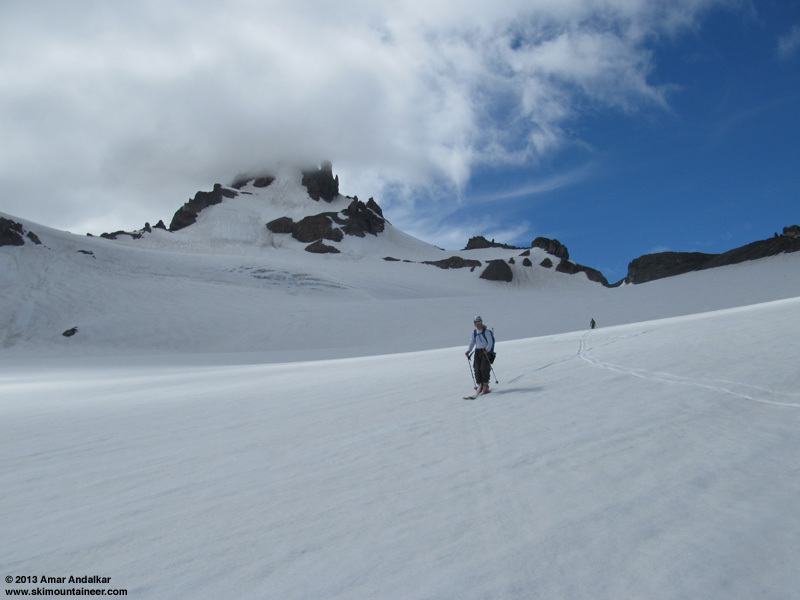 Skiing smooth corn on the Whitman Glacier, with Little Tahoma piercing the clouds above. Then a nice smooth cruise on a couple inches of well-softened corn, not sticky or gloppy at all, the slope perhaps a bit too flat for really great turns though. The snow stayed good all the way down to top of the Cowlitz moraine at 6300 ft, a continuous run of about 4500 vert. Meanwhile the clouds had begun to clear out quickly, back to mostly sunny skies. It was fast approaching 6pm by the time we were skinning once again, across the Cowlitz and back up towards the saddle. The lowering sun was soon bringing huge numbers of glacier worms to the surface, easily dozens to hundreds per square meter. Perhaps billions of them on the several square-kilometer surface of a large glacier such as this one. 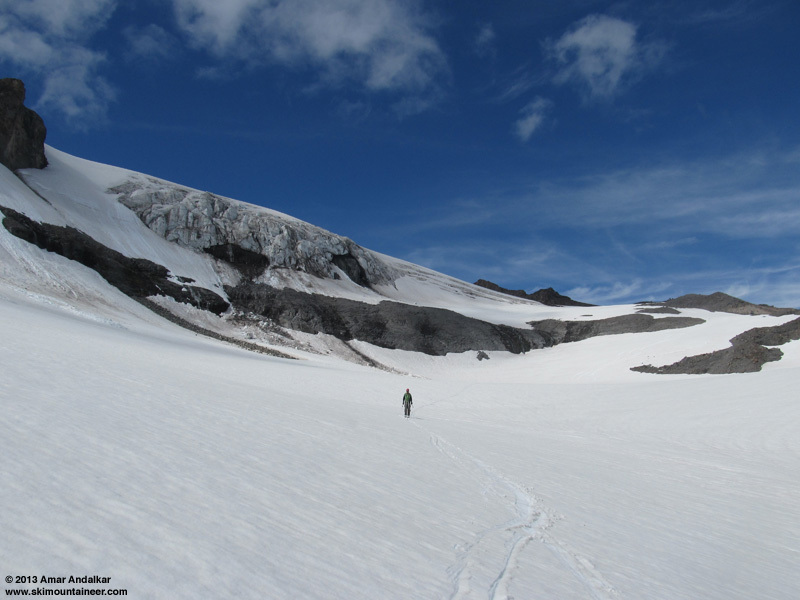 The surface of Cowlitz Glacier is crawling with glacier worms -- many tens of thousands, perhaps even millions, are visible in this single image. 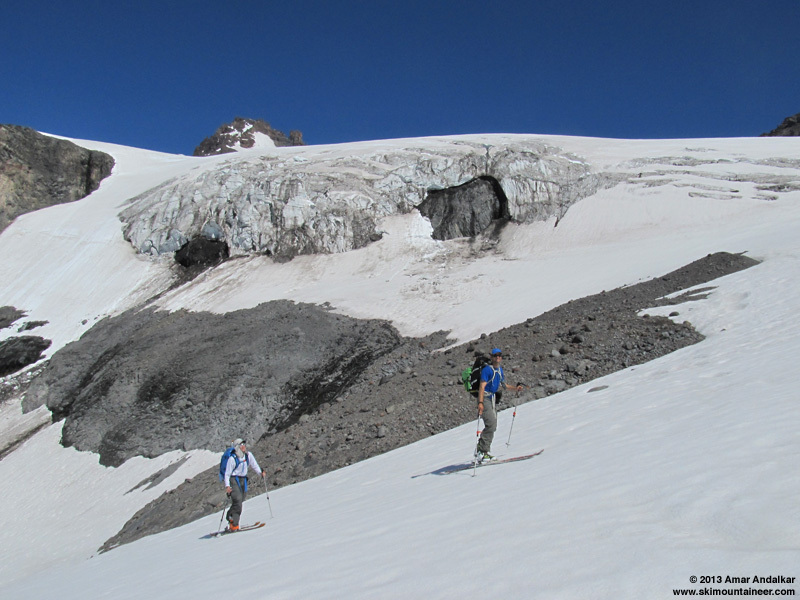 The glacier worms extended past the edge of the Cowlitz Glacier proper and all the way up the slope to Cowlitz Rocks saddle, implying that this slope is completely underlain by glacial ice, a separate side branch flowing down into the main Cowlitz Glacier. Glacier worms only live where there is permanent glacial ice, so their presence during evening hours is a good telltale as to whether a given "snowfield" is actually underlain by glacial ice and thus really a glacier or glacial remnant. 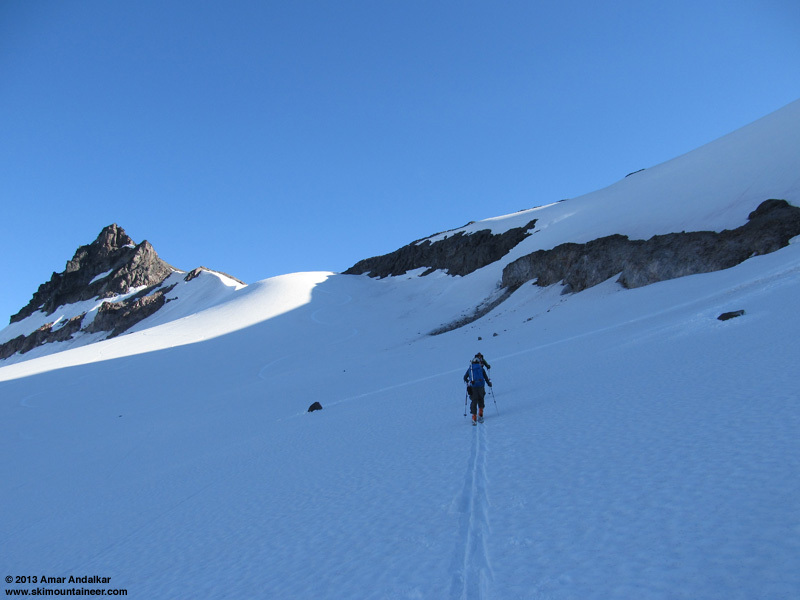 Skinning up the slope towards Cowlitz Rocks saddle, with our morning ski tracks at left. The snow remained good for skiing and not too sticky the rest of the way back from the saddle, but the mostly gentle slopes made travel easiest by straightlining in previous tracks. Several skiers had been up to the Paradise Glacier since we had passed through the same area over 10 hours earlier. As 7pm neared, a new lenticular cloud was forming around the summit of Little T, while strangely Big T remained uncapped. We enjoyed a few more good turns on the west slope of Mazama Ridge and all the way down to the pavement at 4th Crossing, arriving a bit after 7pm, just over 12 hours since we had left. An outstanding day with great company, jaw-dropping views, and mostly good ski conditions, especially if we gloss over the part from 10800 to 9600 ft. It was time to enjoy some beers at the car, and cap off the day in style with burgers and desserts at the Copper Creek Inn. The low route from Paradise to Little T described above appears in no published source as far as I know. The several published Rainier and Cascades climbing guidebooks which include Little Tahoma (Beckey, Van Steen, Gauthier, Smoot) list only the the most popular route from Fryingpan Creek (via Summerland and Fryingpan Glacier to the Whitman) and also the high route from Paradise (or from Camp Muir) which crosses the heavily-crevassed upper Cowlitz and Ingraham Glaciers above 8000 ft, along with 2 significant often-bare rock ridges, to reach the Whitman. I have personal experience on all 3 of these routes: summiting Little Tahoma previously 3 times from the Fryingpan side (July 2009, June 2011, and July 2012), taking the Paradise low route 3 times prior to this trip (turning around at 9500 ft in May 2011, 10400 ft in April 2012, and stopping just a few vertical feet short of the true summit during this winter, February 2013, when the last bit of rock was too icy for my comfort level), and attempting the Paradise high route once (May 2010, which we gave up due to crevasse issues on the Cowlitz and incoming thunderstorms, diverting to Camp Muir instead). 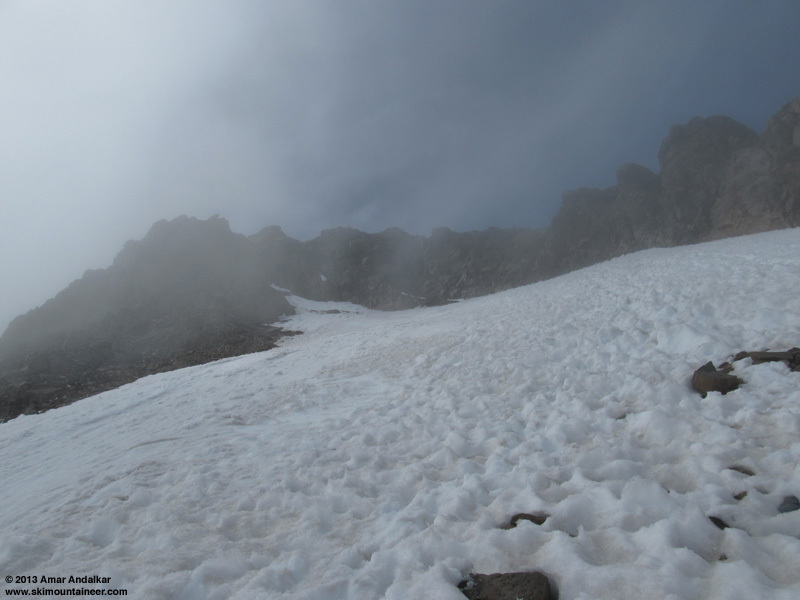 As a ski route, the high route is not good at all, with significant crevasse hazard and up-down traversing above 8000 ft (along with lots of bare rock on the 2 ridges in spring and summer), and the only reason to go that way on skis would be if one is already staying at Camp Muir and wishes to access Little T from there. The Fryingpan route is a fine route for skiing or climbing, very enjoyable and scenic, but the Paradise low route is a better choice for skiing when it is still fully snow covered and the Fryingpan route no longer is (after early May in most years, i.e. by the time the road to White River is open, although in an exceptional snow year like 2011 the Fryingpan route may be all snow into early June). Currently there is 3.5 miles of bare trail to hike on the Fryingpan route versus nearly 100% snow coverage on the Paradise low route, so our choice was an easy one this time. The low route also has by far the least crevasse hazard of any of the 3 approach routes to Little T. For climbers on foot, though, the low route makes little sense since it is longer and involves a descent of 900 ft on the way in and the same climb on the way back. But it is a wonderful ski route, actually it feels like a very scenic ski tour near Paradise which fortuitously (and perhaps a bit circuitously) delivers the skier all the way up to the highest snows of Little Tahoma. SYNOPSIS...AN UPPER LEVEL RIDGE MOVING OVER WESTERN WASHINGTON WILL ALLOW CLOUDS TO GRADUALLY DIMINISH FRIDAY NIGHT AND SATURDAY...BECOMING MOSTLY SUNNY BY SATURDAY AFTERNOON. AN UPPER LEVEL TROUGH WILL APPROACH THE REGION SUNDAY WITH LIGHT RAIN SPREADING GRADUALLY NORTHWARD ACROSS THE AREA THROUGH THE DAY. THE AIR MASS OVER THE CASCADES WILL ALSO BECOME UNSTABLE SUNDAY AFTERNOON AND EVENING AS THE TROUGH APPROACHES...FOR A CHANCE OF THUNDERSTORMS. AN UPPER LEVEL LOW WILL DEVELOP OVER THE NORTHEAST PACIFIC NEXT WEEK PUTTING THE AREA UNDER MOIST SOUTHWEST FLOW ALOFT WITH SEVERAL WEAK WEATHER SYSTEMS EXPECTED TO AFFECT THE AREA. FRIDAY NIGHT...MOSTLY CLOUDY IN THE EVENING THEN BECOMING PARTLY CLOUDY. FREEZING LEVEL NEAR 10000 FEET. SATURDAY NIGHT...MOSTLY CLOUDY. FREEZING LEVEL NEAR 11000 FEET. SUNDAY...MOSTLY CLOUDY. A CHANCE OF RAIN AND SNOW IN THE MORNING...THEN A CHANCE OF RAIN...THUNDERSTORMS AND SNOW SHOWERS IN THE AFTERNOON. SNOW LEVEL NEAR 9500 FEET. SUNDAY NIGHT...RAIN...THUNDERSTORMS AND SNOW SHOWERS IN THE EVENING...THEN RAIN AND SNOW AFTER MIDNIGHT. SNOW LEVEL NEAR 10000 FEET. MONDAY...MOSTLY CLOUDY WITH A CHANCE OF RAIN AND SNOW SHOWERS. SNOW LEVEL NEAR 8500 FEET. MONDAY NIGHT...RAIN AND SNOW SHOWERS LIKELY. SNOW LEVEL NEAR 9000 FEET. TUESDAY...RAIN AND SNOW LIKELY. SNOW LEVEL NEAR 8000 FEET. TUESDAY NIGHT...RAIN AND SNOW SHOWERS LIKELY. SNOW LEVEL NEAR 8000 FEET. WEDNESDAY...MOSTLY CLOUDY WITH A CHANCE OF RAIN AND SNOW SHOWERS. SNOW LEVEL NEAR 7500 FEET. WEDNESDAY NIGHT...MOSTLY CLOUDY WITH A CHANCE OF RAIN AND SNOW SHOWERS. SNOW LEVEL NEAR 9000 FEET. THURSDAY...MOSTLY CLOUDY WITH A CHANCE OF RAIN AND SNOW SHOWERS. SNOW LEVEL NEAR 10500 FEET. THURSDAY NIGHT...MOSTLY CLOUDY WITH A CHANCE OF RAIN AND SNOW SHOWERS. SNOW LEVEL NEAR 11500 FEET. FRIDAY...MOSTLY CLOUDY WITH A CHANCE OF RAIN AND SNOW SHOWERS. SNOW LEVEL NEAR 9000 FEET. The low route also has by far the least crevasse hazard of any of the 3 approach routes to Little T. For climbers on foot, though, the low route makes little sense since it is longer and involves a descent of 900 ft on the way in and the same climb on the way back. 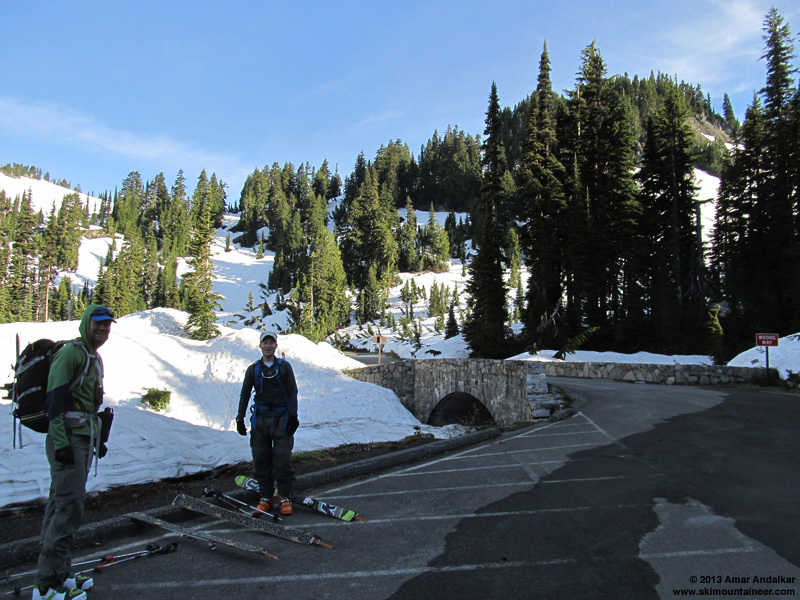 But it is a wonderful ski route, actually it feels like a very scenic ski tour near Paradise which fortuitously (and perhaps a bit circuitously) delivers the skier all the way up to the highest snows of Little Tahoma. I totally agree a wonderful ski route. 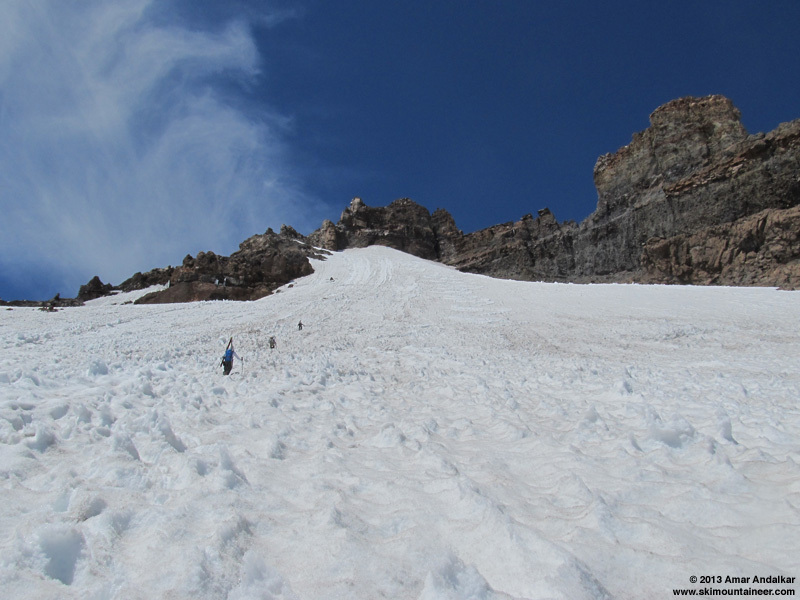 One note of caution is that latter in the year (July August )crevasses do open on the flatter section between Cowlitz Saddle and Whitman up track. Maybe by then a ski tour becomes impractical as a party would be traveling parallel to the crevasses. Excellent report as always. Thanks! Great TR Amar! I had a strong feeling you would be doing Little T soon after reading our TR. I believe the solo women you met up there was Linsey! Just amazing pictures, thank you!! Great TR! Spot on with the description of the view, I�m still shell shocked from it. Truly amazing and indescribable . That's our friend Linsey there! Good that you were able to team up with her. She said she found a Black Diamond shovel on Fryingpan Glacier around 7000/8000 ft. If it's yours, message me and I will connect you with Linsey. She doesn't have a TAY account so I am posting on her behalf.